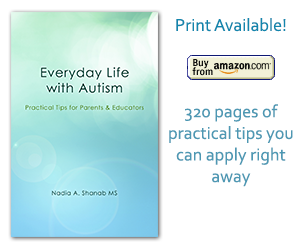 “This site”, autism-tips.com, does not provide medical advice, diagnosis or treatment. See Additional Information. The contents of the “This Site”, such as text, graphics, images, and other material contained on the BLOG Site (“Content”) are for informational purposes only. The Content is not intended to be a substitute for professional advice, diagnosis, or treatment. Always seek the advice of your qualified health provider with any questions you may have regarding a medical condition. Never disregard professional medical or behavioral advice or delay in seeking it because of something you have read on the “Site”. “This Site” does not recommend or endorse any specific tests, products, procedures, opinions, or other information that may be mentioned on the Site. Reliance on any information provided by “This Site” authors or others that are adding comments on the Site, or other visitors to the Site is solely at your own risk. If you find any of the Site materials offensive, you may not want to use our Site. The Site and the Content are provided on an “as is” basis. We are not responsible for the content of the other webpages that we link to. THE USE OF THIS SERVICE IS ENTIRELY AT YOUR OWN RISK, AND IN NO EVENT SHALL THE AUTHOR(S) BE LIABLE FOR ANY DIRECT, INDIRECT, INCIDENTAL, CONSEQUENTIAL, SPECIAL, EXEMPLARY, PUNITIVE, OR ANY OTHER MONETARY OR OTHER DAMAGES, FEES, FINES, PENALTIES, OR LIABILITIES ARISING OUT OF OR RELATING IN ANY WAY TO THIS SERVICE, OR SITES ACCESSED THROUGH THIS SERVICE, AND/OR CONTENT OR INFORMATION PROVIDED HEREIN. YOUR SOLE AND EXCLUSIVE REMEDY FOR DISSATISFACTION WITH THE SERVICE IS TO STOP USING THE SERVICE.